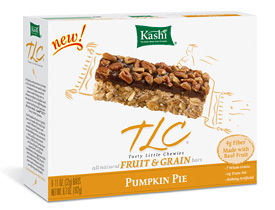 This week, we are head-over-heels in love with Kashi’s TLC Fruit and Grain Bars. These scrumptious bars come in three decadent flavors like dark chocolate coconut, pumpkin pie and chocolate raspberry. Each one packs Kashi’s signature Seven Whole Grains and protein mix and they contain no high fructose corn syrup, sugar or trans-fats. Our favorite is the pumpkin pie. It tastes exactly like the smoothness of a slice of the real thing with just the perfect combination of cinnamon, ginger and nutmeg. Each bar contains about 120 calories, 4 grams of fiber and 4 grams of protein. These delish bars are perfect for a pre- or post-workout snack or when the need for something sweet (but not naughty) arises. Heather's background in nutrition and wellness only strengthens her work as a certified Ashtanga yoga instructor. This dedicated yogi has studied in India twice, and loves a Madonna-inspired workout mix.